The most exciting addition to Grayne’s goggle line this year, the Valdez Blackout goggle is the fastest and easiest lens change available! Frameless technology on the bottom and top of the Valdez enhances sight without blocking peripheral vision. For lens changes the Valdez utilizes a new hinge lever that has brought lens removal time down to a mere 3 seconds! Reinstalling a lens is nearly just as quick and easy which means no fumbling with or damaging lenses when swapping them out! Utilizing Grayne’s superior moisture-locked dual lens technology, the Valdez lens is a spherical shape with 5x military grade anti-fog which means fog free vision in any conditions! 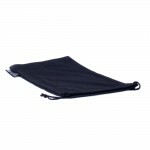 The lens is then given a coating of an ultra-hardened anti-scratch layer for protection. The tinting of each Valdez lens then provides complete UV protection to shield your eyes from harmful rays. Add in the 100% anti-microbial Ultrafoam and full ventilation and you’ll find the Valdez is simply the most fog-free and easy to use goggle on the market. 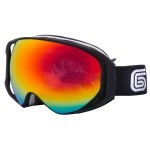 Grayne also includes a microfiber bag with every goggle to protect them on each trip up the mountain.